Codling moth (CM) -- Codling moth development as of July 16: 2nd generation adult emergence at 4% and 1st generation egg hatch at 99%. 2nd generation 7% CM egg hatch: July 29, Tuesday = target date for first spray where multiple sprays needed to control 2nd generation CM. 2nd generation 30% CM egg hatch: August 8, Friday - target date where one spray needed to control 2nd generation CM. Lesser Apple Worm (LAW) -- 2nd LAW flight begins around: July 12, Saturday. Obliquebanded leafroller (OBLR) -- 1st generation OBLR flight begins around: June 12, Thursday. Early egg hatch and optimum date for initial application of B.t, Delegate, Proclaim, Intrepid, Rimon, Altacor, Belt, Voliam Flexi, pyrethroid or other insecticde effective against OBLR (with follow-up applications as needed); June 27, Friday. Where waiting to sample late instar OBLR larvae to determine need for treament is an option, or to check on results from earlier sprays: Optimum sample date for late instar summer generation OBLR larvae: July 5, Saturday. If first OBLR late instar larvae sample is below threshold, date for confirmation follow-up: July 8, Tuesday. Oriental fruit moth (OFM) -- 1st generation OFM flight starts: May 9, Friday; 1st generation 55% egg hatch and first treatment date, if needed: June 2, Monday. 2nd generation OFM flight begins around: July 1, Tuesday. Second generation - first treatment date, if needed: July 8, Tuesday. 2nd generation - second treatment date, if needed: July 19, Saturday. Redbanded Leafoller (RBLR) -- 2nd RBLR flight begins around July 2, Wednesday. Peak catach and approximate start of egg hatch: July 14. Spotted tentiform leafminer (STLM) -- 2nd STLM flight begins around June 19, Thursday. Rough guess of when 2nd generation sap-feeding mines begins showing: July 7, Monday. Optimum first sampel date for 2nd generation STLM sapfeeding mines is July 13, Sunday. Second optimized sample date for 2nd generation STLM sapfeeding mines, if needed: July 19, Saturday. Third optimized sample date for 2nd generation STLM mines, if needed: July 30, Wednesday. White apple leafhopper (WAL) -- 2nd generation WAL found on apple foliage: August 8, Friday. I suspect potato leafhopper (PLH) will show up any day now -- be prepared to treat young plantings of apples in particular. Apple maggot fly (AMF) will become active -- you probably know if you have a perpetual problem with this insect pest, and if so, consider including an insecticide effective against AMF. Monitoring traps (usually red sticky balls) should certainly be out in the orchard by now. Now would be a good time to treat trunks/graft unions/rootstocks of dwarf apple trees for dogwood borer (DB) with Lorsban. The fire blight situation contines to play out. Most orchards have aggressively removed obvious fire blight. (Including here at the UMass Orchard.) I want to say the worst of it is over, however, be advised that hail/strong wind with rain can re-activate blight and you would be advised to put streptomycin on within 24 hours of any such trauma even if you have any history of blight in the orchard. Be very careful using low rates of copper to help suppress blight -- almost any copper spray could cause fruit russet if applied under the right (or wrong?) conditions. I would suggest everyone take a deep breath -- and re-read this article from Kari Peter at Penn State: http://extension.psu.edu/plants/tree-fruit/news/2014/disease-update-the-fire-blight-saga. Fire blight is not good, but it is not the end of the world. (Well, maybe more so on young plantings with susceptible variety/rootstock combinations that were NOT de-blossomed or did NOT receive streptomycing application(s).) Fire blight has evolved with susceptible apples and pears to not wholly kill it's host. (Which is a good thing for both of them.) This year should be a a good learning experience/wake-up-call for all of us, and I can say from experience, once you have had fire blight to any degree, you will become a much better manager of this disease in the future. Let's just hope we don't over-use streptomycin such that the bacteria becomes resistant. That said, be sure to apply streptomycin only when needed, i.e., during bloom when conditions warrant (as dictated by Maryblyt or Cougar Blight models) or during trauma events during the summer. Also, don't forget UMass has a rather comprehensive fact sheet on manageing fire blight: An Annual Fire Blight Management Program for Apples (and Pears). I had not even begun to think about harvest management, but please see Duane Greene's write-up below on using ReTain to get more fruit picked. Oh yes, it's getting time to collect leaves for foliar nutrient analysis. Please see PLANT SAMPLE SUBMISSION FORM FOR TREE FRUIT for details and instructions on submitting leaves for nutrient analysis to the UMass Soil and Plant Tissue Testing Laboratory. 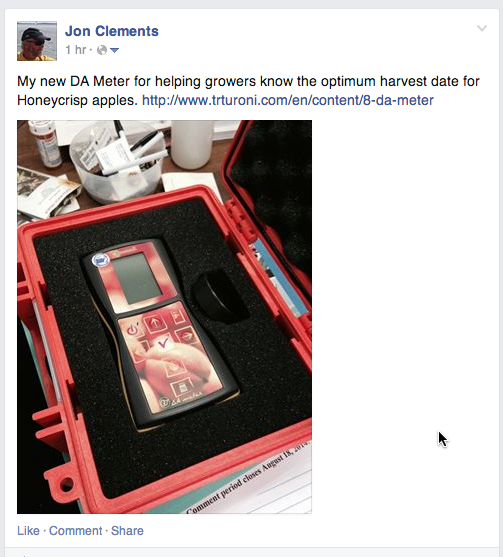 See Upcoming Pest Events, AgRadar, and The Way I See It for current pest status. The time for preharvest drop control application will soon be here. In an attached article we summarize results from preharvest drop control studies done over the past 5 years. Based upon these studies we are making recommendations for this coming season. The major goal in these studies was to come up with a strategy to extend acceptable drop control to the Columbus Day weekend. In situations where drop control is not required as late as the Columbus Day weekend, less ReTain will be required. We selected a base time of application of 3 weeks before the start of anticipated harvest which this is consistent with label directions. Applying the first ReTain application at this time achieved reasonable drop control while having a reduced effect on delay in red color development. An application of one pouch (333g) per acre generally resulted in drop control (less than 20% drop) for between 34 and 40 days. If additional drop control is desired then additional amounts of ReTain will be required. In previous studies an additional ½ pouch of ReTain per acre applied 2 weeks after the first ReTain application provided some additional drop control. In 2013 applying a full pouch of ReTain per acre 2 weeks after the first full pouch resulted in excellent drop control with less than 20% drop through the Columbus Day weekend. Does the addition of NAA help when applied with ReTain? In the 4 years when NAA was included with the base rate of ReTain applied 3 weeks before anticipated harvest, it extended drop control in only one year. The reason for this is unclear. In all 5 years when NAA was included in some combination with ReTain as a drop control agent it did not advance ripening unless too little ReTain was used. In general, one pouch of ReTain per acre with 10 ppm NAA resulted in no advanced ripening. However, if the amount of ReTain applied with NAA was below ½ pouch per acre advanced ripening did occur. Base recommendation for 2014. Apply one pouch of ReTain per acre 3 weeks before anticipated harvest. Follow this application with ½ pouch per acre 2 weeks later. This should provide drop control through September. If retardation of ripening is desired an earlier application will be necessary. If longer drop control is desired increase the amount of ReTain to 1 pouch per acre 2 weeks after the first application. The ReTain label restricts application to no more than 1 pouch per acre per time of application. In formulating your own strategy 2 rules-of-thumb are useful. First, the more ReTain you apply the better (longer) the drop control. This is a linear response. Second, the earlier the application the greater the retardation in fruit ripening you can expect. Sooty blotch/flyspeck and summer rots. It’s time deal with summer diseases. The most common of these is the blemish disease, sooty blotch/flyspeck, or SBFS. Infections for SBFS can start on fruit starting now. If fruit gets infected, the blotch and flyspeck signs usually stay invisible for several weeks, showing up on fruit in August or later. Summer rots, including black rot, white rot and bitter rot can also get started at this time of year, and will show up when fruit starts to mature in late July or after. Fruit that are protected with an effective fungicide won’t get infected. The list of apple fungicides recommended in the summer is much shorter than the list for use in the early season. They should be applied as a combination with the protectant Captan. No more than 32 lb. active ingredient (40 lb. Captan 80; 64 lb. Captan 50; 32 qt. Captan 4L) can be applied per acre per growing season. So, if you’ve used a lot of Captan against scab, keep the limits in mind. Also, efficacy ratings depend on using maximum label rates. Flint plus Captan; Sovran plus Captan; Luna Sensation plus Captan; Merivon plus Captan; Pristine plus Captan. The most effective fungicide combinations against both summer diseases and fruit rots. However, all of them contain a strobilurin, and there are label limits on the total number of applications that can be made in a season – four – and the number of consecutive applications – two – as well as the total amount that can be applied. All of these combinations have a long residual. For SBFS, Pristine plus Captan is estimated at 21 days or 2.5 inches of rain, whichever comes first. The other four combinations are estimated to be about equal to that, 21 days or 2 inches of rain. Topsin M plus Captan; Inspire Super plus Captan; ProPhyt or other labeled phosphite plus Captan. These combinations are excellent against SBFS, with residuals of 21 days or 2 inches of rain. However, their control of summer rots depends largely on using a high rate of Captan. Topsin M is limited to 64 oz. per acre per season, and should be used at or near the maximum rate, 16 oz./A, for the best control. Inspire Super is limited to 60 fl. oz./A per season, and should be appied at 12 fl. oz./A. Captan alone is effective against both SBFS and summer rots, but not as effective as the combinations above. It’s residual efficacy is limited to 14 days or 1.5” of rain. People who use NEWA, SkyBit or AgRadar to help with SBFS management can find out what the present risk of disease is. Each of these decision support systems is a little different in terms of how they calculate the need to apply a fungicide. NEWA is the most conservative, SkyBit the most liberal, and AgRadar somewhere in between. Probably the most important factor to keep in mind is whether the last fungicide is still effective. NEWA and AgRadar will provide that information; SkyBit doesn’t, but it’s easy enough to figure out if you have rainfall information for your orchard. For example, if I applied Captan plus Flint on June 19, unless it rains more than 2 inches, I’m fine until July 9. However, if it rained 2 inches by tomorrow, I’d need to reapply then. Don’t forget to consider your last scab fungicide – it is essentially your first summer disease spray. The next Healthy Fruit will be published on Tuesday, July 29 or thereabouts, 2014. (In two weeks.) As always feel free to get in touch with any member of the UMass Fruit Team (http://extension.umass.edu/fruitadvisor/team-members) if you have questions or comments.